A very distinct memory when studying poetry in college was during a comprehensive exam during my final semester. The exam was designed to test my knowledge of poetic form and technique, and I recall fretting endlessly that I would forget the difference between trochees, enjambment and caesuras. It seemed crucial then, and a tad trifling now. I don't remember much of the exam, or even how well I did on it, but I do recall the professor, Dr. Gregory, administering the exam and telling us: "Good luck, and don't forget to enjoy the poems." Two years later I sometimes wonder what use it was studying any of that at all. To seriously scrutinize and analyze poetic form and structure as I was wont and made to do then seems almost petty now as I figure out how to pay for this month's car bill, but what always lingers is that reminder to enjoy the poetry. Such thoughts flooded through my mind as I watched Jim Jarmusch's latest film Paterson again recently, then again, my viewing habit mimicking the repetitive structure of the movie itself: Paterson (Adam Driver) wakes on Monday morning beside his wife Laura (Golshifteh Farahani) and through the day experiences moments of banality, sublimity, perhaps even banal sublimity, as he drives a bus and jots down poetry during fleeting windows of freedom. Tuesday morning: repeat. As Jarmusch takes us through an entire week of this man's life, and in stressing the cyclical pattern of a typical work week he manages to accentuate the minute details that suddenly take on heightened significance against the back-drop of such a repetitive structure. There's two young boys talking about Rubin "Hurricane" Carter on the bus and Jarmusch observes their innocent faces, their shoes, a woman drinking coffee next to them, and a subtle smile on Paterson's as he eavesdrops. Suddenly a tiny world is created within the context of a routine daily bus trip. 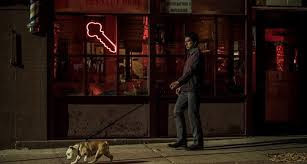 There's a rapper practicing a new song in the laundromat at night, and Paterson stops to listen because Jarmusch is in no hurry to get this character anywhere in particular. We simply exist with him and the average everydayness of his life. As a culture we seem to despair over the weekly routine and then are baffled that so much time has flown by without actually pausing to consider what has actually happened in that time. Instead we require as many distractions from the cyclical nature of life as possible: smart phones, binge watching, social media, sports, etc... You will not find any of that in the movie Paterson, which presents such a unique look at American life that its seems of a different era (Driver's character even seems like he would be more comfortable in an earlier time based on his disinterest in modern technology--he doesn't even own a cell phone). In presenting a character who accepts the boring routine of life, Jarmusch shows how such a routine can take on a beauty and elegance of its own. Inside the film's central structure around each day of the week exist all sorts of mini-structures that bring a sort of cadence to Paterson's life. We don't quite know what sort of frustrations or anxieties lie within him (a bedside table photo of him in a military uniform has led some to suggest the film is a portrait of PTSD, a claim I neither deny nor really wish to expatiate, as such a notion seems antithetical to the film's agenda-defying ordinariness), but we gather that what for some would be tired repetition for him becomes a comforting rhythm. Waking at the same time each morning, eating the same cereal for breakfast, working a job that literally repeats itself, and attending the same bar each night for exactly one glass of beer. How boring, one might say, but the film counters that with the notion that to find pleasure and solace and acceptance in such things is the secret to life. Rather than simply accepting life as mundane, Paterson turns the quotidian into something interesting and worthwhile. He sees an Ohio Blue-Tip matchbox on his kitchen table, and starts a poem about it: 'We have plenty of matches in our house, we keep them on hand always. They are excellently packaged, sturdy little boxes, with words lettered in the shape of a megaphone, as if to say out loud to the world: here is the most beautiful match in the world.' In Paterson's eyes, the beautiful and the mundane are of a piece. We are surrounded by minutiae, and what we make of it is the difference between anxiety that the world is not very satisfying to a sense of peace that we can conjure beauty and wonder over something as seemingly random and plain as a matchbox. Those last lines indicate love as a fierce source of inspiration, and while they may not be the best poetry that this character produces (though the matchbox poem as a whole is quite stunning), there's something deeply affecting about seeing Paterson's feelings articulated in his notebook. Since Jarmusch essentially adopts the same attitude as his protagonist, the sense of rhythm with which Paterson lives his life becomes the film's own tempo. The pace of Paterson never changes, thus it has no stride it needs to hit. It simply exists and watches without judgement the life of a man who himself simply exists and watches without judgement. As viewers we feel obliged to do the same, thus trying to read too much into this character, who he is, what's really going on inside him, seems somewhat fruitless. This is a movie to coast along with, to sink into, to exist along side of. Jarmusch's attitude seems akin to my professor's: don't forget to enjoy this. It's also hard to watch Paterson and not feel the entire form and history of poetry seeped within the film's DNA. It's not just about a poet and the poetic process; its very structure feels like stanzas dividing a poem, its patterns-within-patterns like perfectly calculated internal rhymes. On top of that, the film is rife with references to other poets, from Petrarch to William Carlos Williams. And if the film is ultimately about finding peace within life's cyclical nature and its inherent repetition, then you might think Paterson keeping a postcard of Dante Alighieri in his lunchbox would be loaded with significance. A comment on the famous Inferno sequence in The Divine Comedy and its correlation to Paterson's own inner torment and suffering could be a possibility. But that ultimately reads too much into Paterson's secrets and his past that we are not made privy to. I feel the last thing we are meant to do in watching this movie is attempt to unlock its central character's soul. As such, it might be more useful to consider a poem the film does not reference, but that I think actually could be crucial in understanding what Paterson is really attempting to do: T.S. Eliot's haunting and wondrous 'Preludes.' A four-part stream of consciousness meditation on everyday life in the city (an attack on modernity? Maybe, but such an intense and academic reading of it takes away the poem's more soulful qualities), the poem ultimately suggests that mundane routines can take on their own strange beauty and ceremonious qualities. What is evening but "The burnt-out ends of smoky days" where "A lonely cab-horse steams and stamps." But Eliot then abandons his stanza with the single line: "And then the lighting of the lamps." In its simplicity and singularity this image of the routine of illuminating the night takes on its own significance. We have the choice to turn a chore into a ritual. The literal "lighting of the lamp" symbolically suggests a way to bring light to the darkness of our lives. Eliot's picture of the morning routine after the lamps have long been extinguished seems all too familiar. The image is either dreary and monotonous or oddly comforting. You can take it as you will. You watch Jarmusch's film, and Paterson's wife commenting that he still smells faintly of beer in the morning, and you hear him pour the coffee, and an identical sensation occurs. I think this film shares a deep kinship with Eliot's poem. Some infinitely gentle, infinitely suffering thing: that too, describes Paterson, in the way he responds when asked how he is doing: "Can't complain" or "The Usual" or "I'm okay." Adam Driver's long, somewhat droopy face, his mouth that always seemed bent in a sort of sad-like curve, looks like it was sculpted specifically for this role. Is he happy? Who knows. You sense, though, that this is a character who does not measure his life by happy feelings, but rather by something more like a subdued contentment. He seems to be suffering in some way, but that is okay. Aren't we all? Instead, he is infinitely gentle and the world opens up to him because he experiences it peacefully. Perhaps we could all benefit from seeing the world a bit more like Paterson does. Paterson, above all, is a film to luxuriate in. We ought to wallow in its languid movements and style. We should be comforted by its assurance that the world, as uncaring and senseless as it often came seem, can also be on our side. All you have to do is allow it to be. In a tragic surprise at the end of the film, Paterson's bulldog Marvin chews up his entire notebook of poems. Oh cruel world! the movie seems to scream at us, until Paterson goes on a walk and meets a touring Japanese poet who provides him with a brand new notebook. I take deep solace watching the movie and the way its characters contemplate the world around them. Its subject is poetry, but the movie ultimately is about our relationship to the physical spaces we inhabit and what we do in them and how we ought to think about them. If we can get outside of our daily worries, our domestic anxieties, and our cosmic uncertainties, we will find a world filled with places and people that are either utterly pointless or overwhelming in how much they matter. It's up to you, Jarmusch whispers to us through Paterson's gentle observations. He doesn't need to coax us in the right direction: the simple action of his his movie does all the work: Enjoy.